What do you think of this: The structure of a story is like the layout of a house? You don’t know where to place the quotes and narration of a story until you have the structure in place, just like you can’t move the furniture and decorations into a home until you know where the rooms are. I think it’s an apt metaphor. And, it prompts a question: What’s the structure of a radio story? Well, there’s no one structure. My friend Bradley Campbell and I discussed a handful of approaches in a popular episode of HowSound called “My Kingdom for Some Structure.” Bradley even drew story structures on napkins. But, there is one structure I’m particularly fond of — the ‘e’. Even though Bradley and I talked about it a bit, it deserves a closer look. 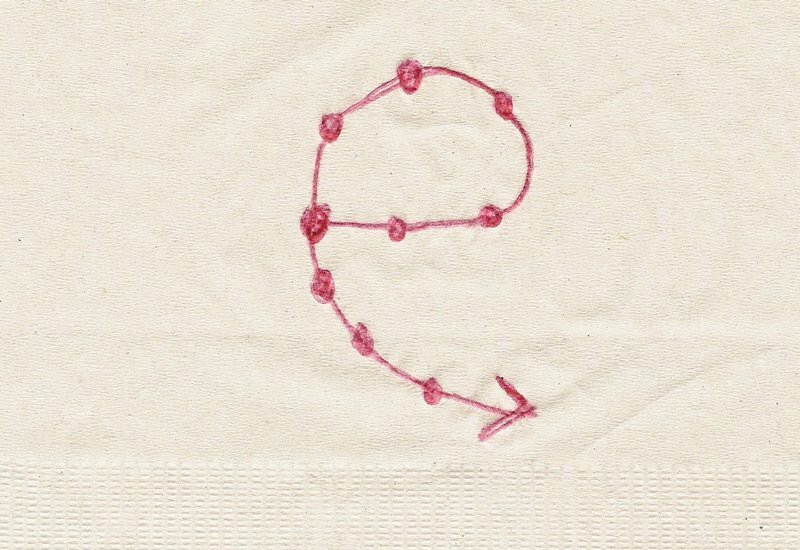 Thanks to Sam Greenspan and Roman Mars, on this edition of HowSound, I’ve dissected an episode of 99% Invisible to reveal how the ‘e’ works. Their show “Half A House” is an excellent example. In addition to explaining it on HowSound, I thought I’d run through it here complete with a couple of my own napkins. 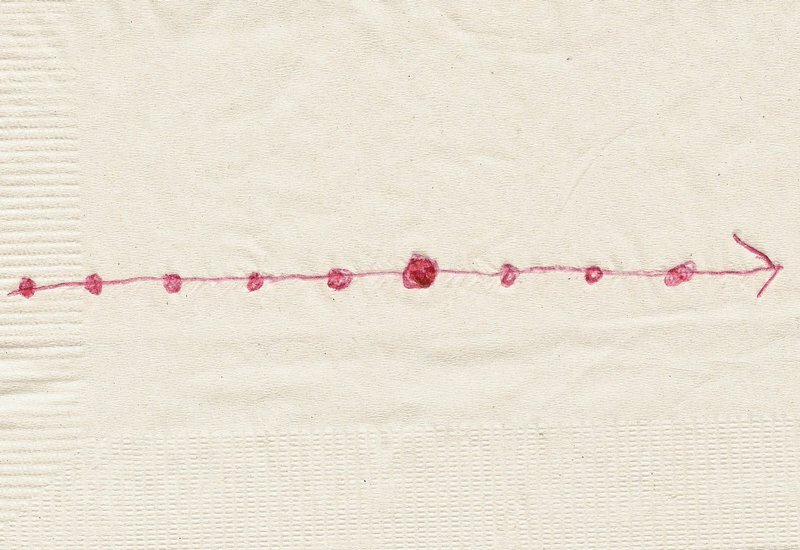 This first napkin is a simple timeline, a series of plot points. Each dot represents an event. First this happened. Then this happened. Then this. Then this. Etc. The idea is tried out and is successful. The idea spreads worldwide. It’s lauded in the architecture community. Chile employs this type of housing in several locations. In 2010, there’s an earthquake. It destroys the town of Constitucion. Luis Enriquez loses his home. 2012, the town is redeveloped using, in part, partially built homes. Luis gets one of these homes. Starts finishing it. Other people start businesses in the second half of their homes. Story plot points on a timeline. When putting together a radio story, you don’t have to start at the beginning of the story’s timeline. You can start anywhere. Usually, you open a story at a point on the timeline where there’s a scene that grabs a listener’s attention and introduces them to what the story is about. “Half a House” starts with the earthquake and a brief statement about half-built homes being used when they rebuilt Constitucion so I’ve placed a big dot there (and bolded it above). Frequently, when you open a radio story with a plot point from the middle of a timeline, a common next step is to go all the way back to the very beginning of the timeline. Doing so helps explain the opening of the story by providing history and context. The next napkin shows what that looks like. Basically, you just curve the line up and over until the earliest event in the timeline connects to the point at which the story started. That’s what happens in “Half a House.” After the earthquake and mention of the half-built homes, the story goes back to the 1970s and the inception of the idea. Next, in the radio story, you just follow the dots. This happened, then this happened. . . until the story reaches the point where it started. At that juncture, the story usually references what was already said in the opening scene — something brief — then moves forward and develops the story further until you reach the end. That’s just what happens in “Half a House.” The story follows the development of “incremental housing” until the narrative reaches Chile and the earthquake. Then the story continues taking a closer look at how this type of housing was implemented, followed by some thoughts on employing it in the U.S.